Here’s a super easy and quick summer salad, quite cooling and refreshing when it’s almost too hot out to eat anything! Make sure your sesame oil is fresh, if it smells good it is good. If it’s been hanging out in the back of your pantry for a while it could have gone bad, so check before you pour! Sesame Cucumber Salad, Simply Delicious from SimplyRecipes.com! toasted sesame seeds for sprinkling on top, optional but highly recommended! 1 Peel the cucumbers. Cut them into quarters, lengthwise. (If the seeds are bitter, scrape out the seeds and feed to your worms or compost pile or backyard chickens with the rest of the veggies scraps.) 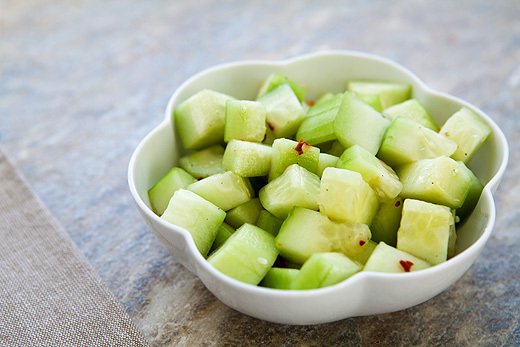 Cut the cucumbers again, crosswise, into 1/2-inch thick pieces. 2 Place cucumbers into a serving bowl. Sprinkle with salt. Toss with sesame oil, seasoned rice vinegar, and chili flakes. Top with toasted sesame seeds and enjoy! Original recipe from SimplyRecipes.com can be found here. Previous Asparagus and Mushroom Herb Salad Next Cooking With My Health Coaching Clients!